A new report reveals how much children worry about war and terrorism and why – and if they don’t worry why not? It also looks at what solutions children have for making the world a safer place to grow up in. The CHILDWISE What Kids Think About…War and Terrorism report interviewed a representative sample of 1,557 children aged between 7 and 16. “This report takes a step back and allows children and teenagers’ words to speak for themselves, in turn allowing us to understand their thoughts, feelings, and opinions on the subject of war and terrorism,” says Dr Helena Dare Edwards, CHILDWISE researcher. “It’s not often that adults hear what kids think about subjects like war and terrorism. But these matters affect them so they have a right to a voice,” says Helena. 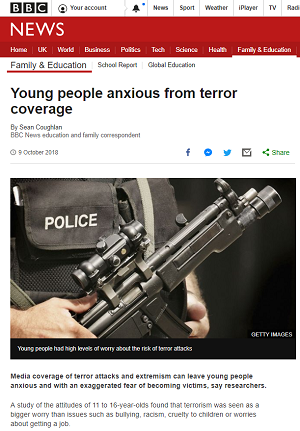 As reported by the BBC, the report claims that "Media coverage of terror attacks and extremism can leave young people anxious and with an exaggerated fear of becoming victims", adding that "terrorism was seen as a bigger worry than issues such as bullying, racism, cruelty to children or worries about getting a job." Dr Reza Gholami, a leading academic in this area and a senior lecturer in sociology of education at the University of Birmingham, wrote an independent foreword to the report. “The findings should act as a wake-up call,” he says. “This report by CHILDWISE has immediate and long-term value to policy makers, the public sector, including educators, third sector and civil society organisations and, of course, the general public,” adds Dr Gholami. Previous research by CHILDWISE has shown war and terrorism are top concerns among children. This latest report expands on this finding. “The focus of the report rests on children’s own words, with their responses complemented by analysis and interpretive commentary to illustrate difference across age and gender and to highlight both majority and minority viewpoints and everything in between,” says Helena Dare Edwards. For a range of anti-radicalisation and PREVENT resources including teaching materials, parents guides and staff training, join our Safeguarding Essentials service.